Sign up to receive news on book releases and special events! Always Cedar Point is an insider’s look at the amusement park business. Its pages are filed with 40 years of stories, drama, humor and a few secrets. 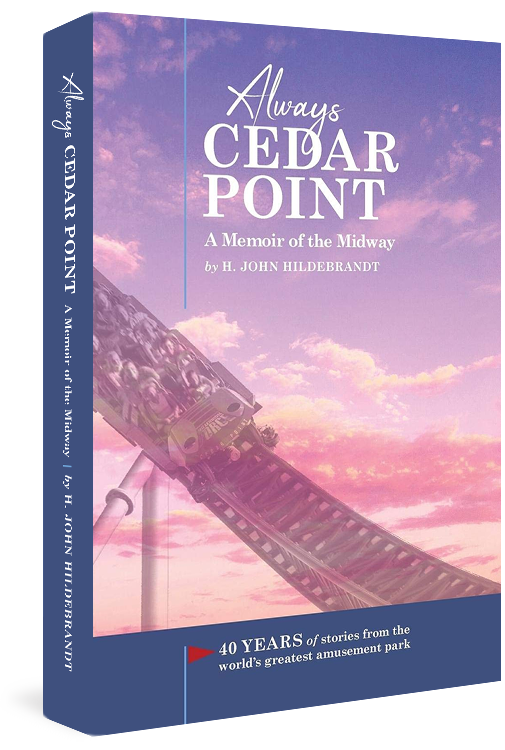 Author John Hildebrandt tells us how he and his team created marketing campaigns that helped establish Cedar Point as America’s Roller Coast and the best amusement park in the world. For 150 years, people have come to rest, relax, and recharge in the area from Vermilion to Port Clinton, south to Milan, Bellevue, and Fremont, and north to Sandusky, Cedar Point, the Marblehead Peninsula, and the Lake Erie Islands. Lake Erie is the constant in this fascinating story, the natural resource that gives the region its character and charm. Quaint wineries, world-class roller coasters, amusement parks, water toboggans, indoor and outdoor water parks, lake steamers and jet boats, cottage communities, sportfishing, swimming, sailing, boating, camping, historical sites, caverns, museums, beaches, Civil War history, resort hotels, religious retreats, and natural wonders – Lake Erie’s shores and islands have a rich tourism and recreation history. For 40 seasons, John Hildebrandt walked the midway at Cedar Point, the world’s best amusement park. Hired as a staff writer in 1974, he rose to VP-Marketing and in 2005 became general manager of the park for nine years, retiring in 2014. A native of Cedarhurst, New York, Marie graduated with a B.S. in journalism from Ohio University in 1971. She worked for the Sandusky Register for nine years before leaving to begin a free-lance writing career. Add me to the mailing list for news on book releases and events! A Cleveland native, John Hildebrandt walked the midway at Sandusky, Ohio’s Cedar Point for 40 seasons. Hired as a staff writer in the PR Department in 1974, he rose to VP-Marketing and in 2005 became general manager of the park for nine years, retiring in 2014. At Cedar Point, John helped create the marketing campaigns that introduced the greatest collection of roller coasters on earth, including Millennium Force, Top Thrill Dragster, Raptor, Magnum, Maverick. He also served one year as general manager of Dorney Park and Wildwater Kingdom in Allentown, Pennsylvania. John received a B.A. in English from the University of Notre Dame and a M.F.A. in Creative Writing from the University of North Carolina at Greensboro. 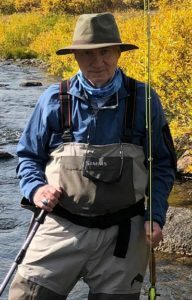 He has written two novels and has published short fiction in several magazines, including the Greensboro Review, Corradi, Cimarron Review, Hellcoal Fiction, and Grafitti. He and his wife, Marie, are co-authors of Lake Erie’s Shores and Islands, a history of tourism in western Lake Erie, published in 2015. John served as president of the Ohio Travel Association and in 2000 received the Paul Sherlock Award in recognition of his contributions to Ohio’s tourism industry. John is active in the local history community and has served as president of the Erie County Historical Society. He has written and lectured on a variety of local history subjects. A longtime student of the Civil War, he has authored a number articles on Civil War subjects, including Sandusky native Jay Cooke, the financier who sold bonds to fund the Union war effort. John and Marie live in Sandusky, where he is at work on his next writing project. John is also at work planning his next fly fishing trip. They have two adult sons and four grandchildren (who love to visit in the summertime). A native of Cedarhurst, New York, one of the “Five Towns” located on the south shore of Long Island near JFK Airport, Marie grew up with a single focus career objective: journalist. This goal was reinforced by a meeting she arranged with the Pulitzer Prize winning New York Times reporter, Harrison Salisbury while she was in high school. A graduate of Lawrence High School, she was editor of the school yearbook her senior year. Marie attended Ohio University and graduated in 1971 with a B.S. in journalism. Following graduation, she was hired by the Sandusky Register as a news reporter, initially assigned to the education beat. Within a year, she was reassigned to cover police and fire; she was the first female reporter in the history of the newspaper to cover police and fire operations. 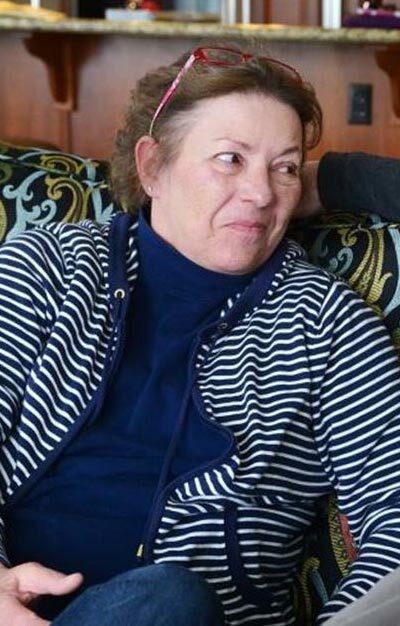 Marie entered politics as a player vs. an observer in 1989 when she ran successfully for trustee of Perkins Township, the suburban community located just south of Sandusky . She went on to serve three four- year terms as a trustee, a period of tremendous growth for the township. She served for two years as chairperson of the Erie Regional Planning Commission. Marie retired from public service in 2003. 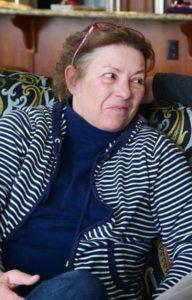 Marie returned to journalism in 2005, recruited by the publisher of the Register to write a bi-weekly opinion column on “all things Erie County.” Her column ran for five years. A collection of her columns, titled According to Marie, was published in 2010. For seven seasons Marie worked part-time at Cedar Point as a makeup artist during the park’s Halloween event. An avid gardener, Marie completed the training to become a certified Master Gardner by The Ohio State University Extension Service in 2000. She writes a bi-weekly column on gardening for the Register. In 2015, she co-authored with her husband, John, a history of tourism in the Lake Erie region. 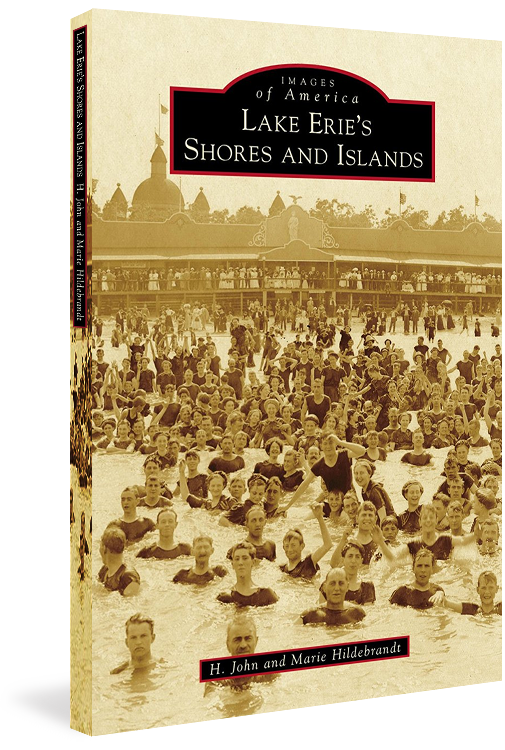 Lake Erie’s Shores and Islands is part of the “Images of America” series of books on local history published by Arcadia.